But the wound is not the reason I decided to treat The Husband and I to blueberry pancakes this morning. It’s all Food & Wine magazine‘s fault—this month’s cover has a stack of pancakes smack on the front, dripping with berries and syrup. It’s had me craving pancakes all week. And, I felt since we had eaten raw food all week and I ran five miles this morning, we deserved it. 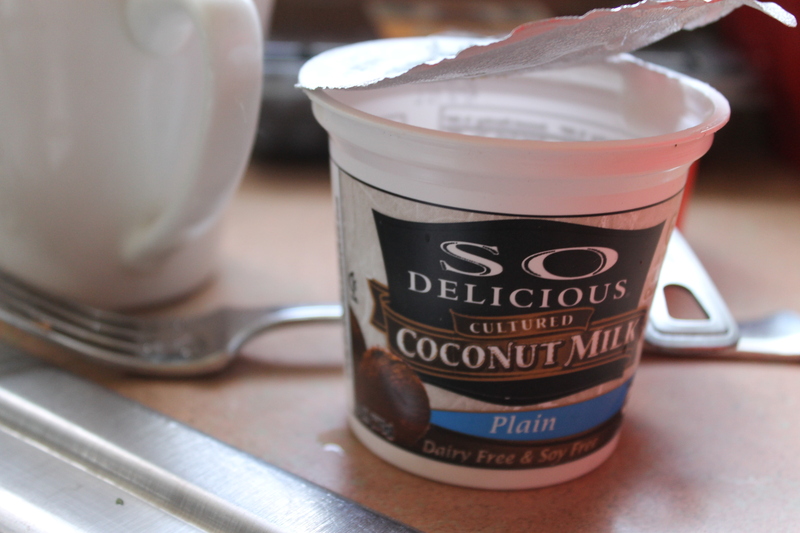 Why coconut yogurt? I like it better than soy. If you're not lactose intolerant, use whatever kind you'd like. I made sure that they were multi-grain, of course, because of course that makes them HEALTHY pancakes, right? No? Shut up. That’s my story and I’m sticking to it. I found a recipe online that reminded me of a recipe from the Santa Barbara News Press I had years and years ago and promptly lost after the first time I made them. I used that recipe as a base and changed it to suit my taste, as I usually do, and I was very pleased with the result. Warning: These are hearty, belly-filling pancakes, so don’t let your eyes be bigger than your stomach. We happily shared three pancakes and were plenty satiated. Oh, and there was the crispy prosciutto on the side.Vegans: This can be easily veganized by mixing the tablespoon of ground flaxseed with some warm water to replace the egg.Note: These would taste equally as yummy with raspberries or sliced bananas instead of blueberries. Put the first eight ingredients into a bowl and stir with a whisk. In a 2-cup measuring cup, add the rest of the ingredients and beat with a fork. 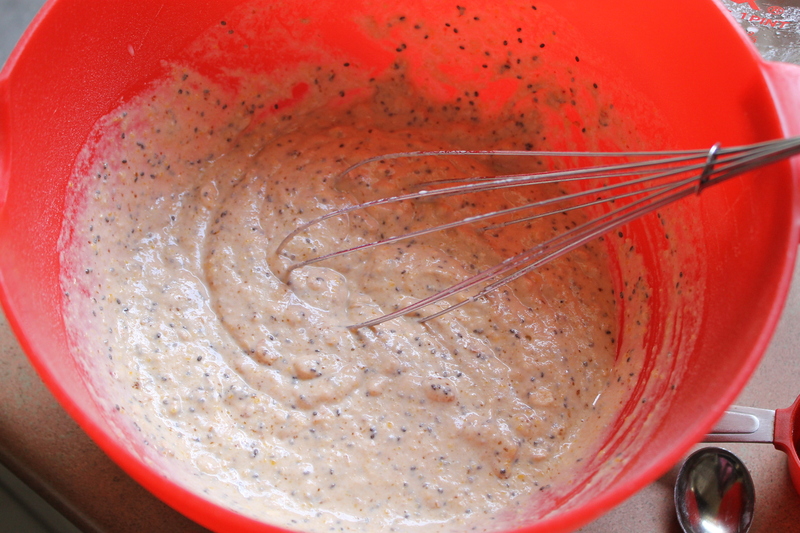 Be sure to mix the liquid ingredients together before adding to the dry--that way you don't overwork your batter. Add the liquid ingredients to the dry ingredients and stir until just thoroughly mixed. Try not to overwork. 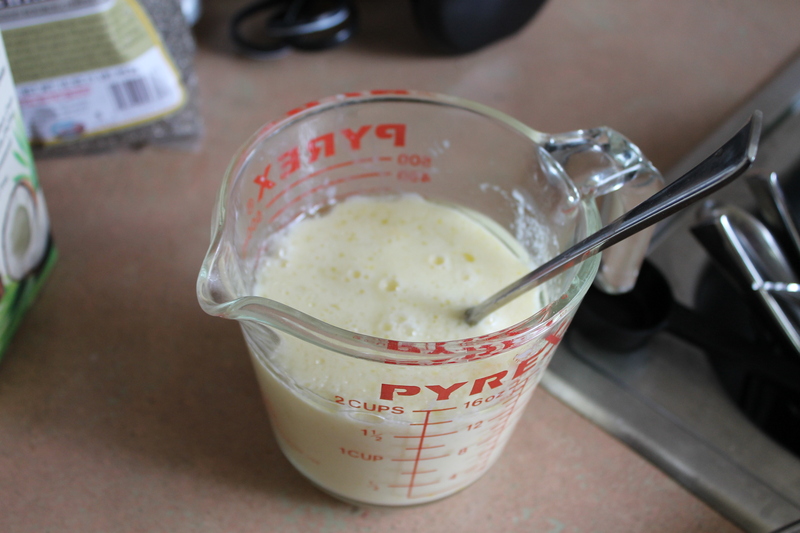 Add a little more coconut milk if the batter seems too thick, but be aware that this is a really thick batter. Have the blueberries (or other fruit) at the ready next to the stove. 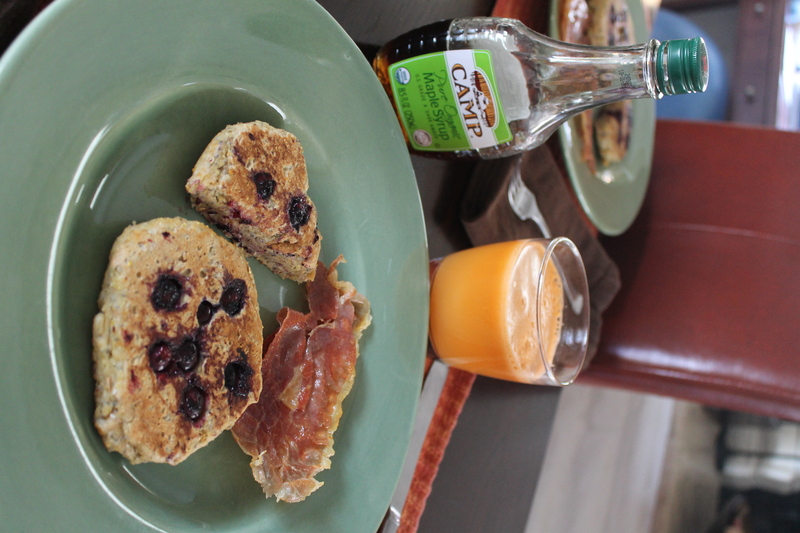 If you are having crispy prosciutto with your pancakes, cook it first and use the same pan for your pancakes. Heat up coconut oil (or any vegetable oil you prefer) in the pan and wait for it to get hot before spooning your batter into the pan. Add the fruit by hand on each pancake, pushing down a little bit—this is why you want the batter pretty thick. Turn pancakes when brown on the bottom and turn down to cook on the other side so you make sure they cook all the way through. You don’t want pancakes that are still gooey in the middle. 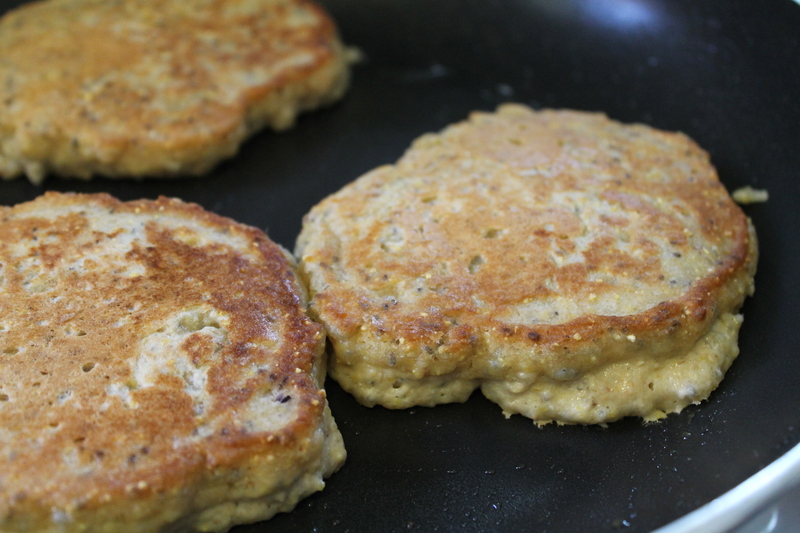 Serve hot with butter or Earth Balance spread and real maple syrup. Please don’t use that fake kind of syrup—these pancakes deserve better. And you really won’t even be able to pretend they’re healthy if you use that goop. And you can see that the juicer and I made up. That’s fresh carrot-apple juice: Three medium apples, four large carrots, one lemon and three inches of fresh ginger. Makes enough for two. Funny we just had these ytaeerdsy morning. Only thing different is we added in some whole spelt flour (tolerate this ancient wheat pretty well) and you are right: Delicious! With a little Grade B maple from the co-op (Grade B is darker and richer-and Better to me). And lots of butter, of course.So good, so filling, so nutritious. Hope others try it too.PS-I didn’t eat again til dinner last night. I have never had gbeenrirgad pancakes. Growing up I wasn’t a pancake fan but have grown to love them now. There are so many flavor combinations that I want to try and this is one of them now! My guys would love them. Now that our son is 2 1/2 years old and starting to understand more and more we have started adding to our list of family traditions. That’s the best part of being a “new” family… you get to improvise and create new traditions. Everyone loves a special treat and you seem to have a great balance for ourself and your family!!! I’m still learning and it’s only my guy and I lol, he’s like, every day is treat day!!! P.S. The pancakes sound super healthy, I’m not judging an inch!